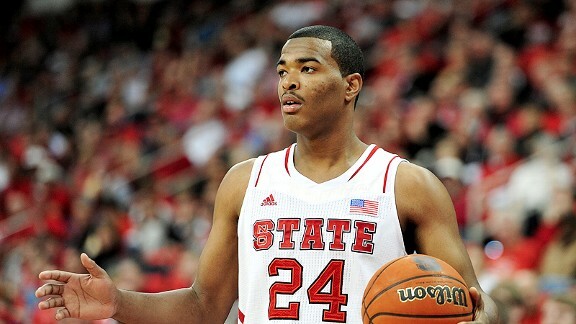 North Carolina State University sophomore forward T.J. Warren announced Tuesday that he will forgo his remaining college eligibility and enter the 2014 NBA Draft. Warren, the ACC Player of the Year in 2013-14, averaged 24.9 points per game and shot 52.5 percent for the Wolfpack. He set school records for points in a single season (871) and games with 20 or more points in a season (31). I remember watching T.J. as a high school junior and thinking that teams were sleeping on him and that his scoring ability reminded me a lot of Paul Pierce. By the time TJ was a senior, he’d gathered offers from several major schools, and decided on NC State. Just a few days before he announced his decision, he talked to me in this video interview about his current thinking. T.J. will be a solid pro player. Scouts and coaches have been doubting his ability since he was in high school, but his ability to score has been proven repeatedly. The one nagging thing that he’ll have to work on at this point is his foul trouble. But that will come, in time. Best of luck to T.J. at the pro level. Want more basketball insight? Follow Marcus Shockley on Twitter, right now. Previous storyJohn Calipari to the Lakers?